The latest release from Wikileaks exposes the truth about the Shard development at London Bridge. We've been told that they're assembling the tallest building in Western Europe, but this is only part of the truth. Wikileaks has now revealed a secret concept image (pictured above), showing the true construction goal. The blueprints, seen by Londonist, make frequent reference to a shady contractor by the name of 'Mr D. Avros'. 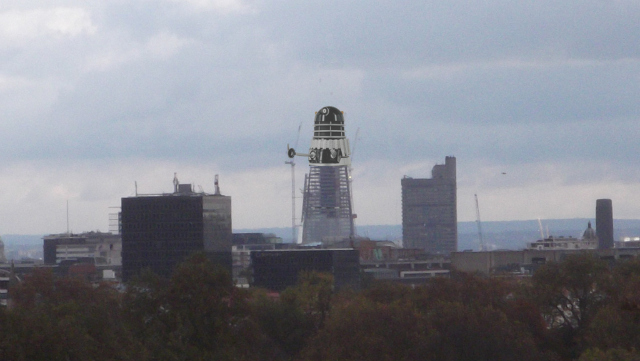 Is this some nefarious Dalek plot to exterminate London? Forewarned is forearmed - we can always call on a previous Touch Up London to save us. Thanks to JamesU for the insider information. Have you got a vision for how the city could, or should be? Take a look through our archives, then get photoshopping (other software-based verbs are available). Send entries to tips - at - londonist.com.